I was scrolling through my camera roll the other day when I realized that I had never shared a post on Artifact Uprising, a VSCO company that makes custom prints, photo books and cards. If you’re anything like me and appreciate VSCO Cam’s minimalist presets for editing photos, then you’ll love Artifact Uprising’s dedication to storytelling even more. We are only as great as the community behind us. we believe in its power to ignite creativity. we strive to cultivate a community of inspired storytellers—of movers, shakers, do-ers, designers, artists, thinkers, joy-makers. With all the snapshots you’ll be taking this summer (everything from drippy ice cream cones and selfies at the beach to pretty sunsets), it only makes sense to turn some of your favorite pics into works of art that you’ll cherish for years to come. Several months back, I received a discount code for 25 free square prints (I only had to pay shipping) and was thoroughly impressed with my experience. Between Artifact Uprising’s intuitive interface (more on that in a second) and the presentation of the prints themselves, I will 100% be using their services again in the future. I was especially pleased with the durability of the prints, which are printed on a recycled cardstock with a textured matte finish. The square shape — complete with a white Instagram-esque border — further gives off an incredibly streamlined appearance. I have to admit, the prints ended up being a lot larger than I had expected, but their 5 x 5’’ size (which is listed in the product description online) actually works just fine. If anything, the size makes each print more tactile and special. Did I mention that the uploading process is incredibly seamless? 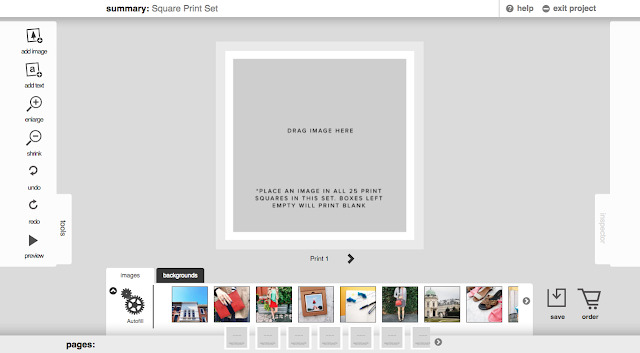 When you’re ready to pick out your prints or create a photo book, you can directly upload pics from your Instagram feed, camera roll or Dropbox. Once you log into Instagram on your computer, the photos will instantly appear along the bottom of the screen — simply drag and drop, and you’re good to go! It’s that easy. Although I’m not sure what I’ll do with my 25 prints (perhaps, I’ll get them framed for a gallery wall some day?! ), they admittedly make great photo props for Instagram. For more inspiration, be sure to follow Artifact Uprising on Instagram, VSCO Grid and Twitter. Will you be using Artifact Uprising's services to print your photos this summer? Let me know in the comments below! This is a great idea. I'd love to have some prints of a few special pics.